No filter needed after today! MAKE UP FOREVER is welcoming this year the new upgraded and enhanced Ultra HD concealer with advanced formula. The UHD concealer comes in 22 different shades from very light to dark to suite all skin tones. Its buildable and dry fast features give the outcome of a Satin finish that reflects light perfect for a subtle look. The Ultra HD 2019 new product is the perfect tools for an ultimate healthy and luminous finish. 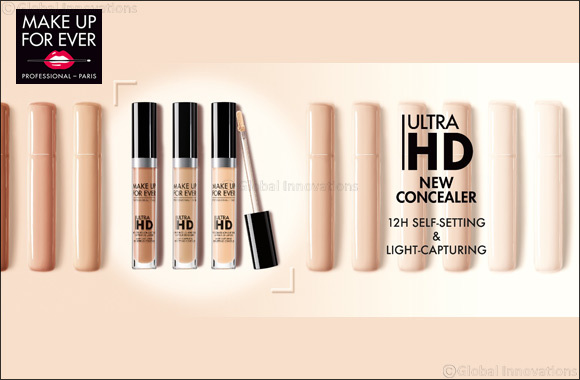 The UHD concealer gives you instant second skin effect, self-setting, and corrective results. Due to its medium coverage, oil free and moisturizing textures that plumps fine lines the product doesn't settle into fine lines and creases. Women request products that allows them to be the best version of themselves, The UHD concealer helps you achieve that second skin effect in 3 small steps. The constant evolution of the film and TV industry’s technology has produced even more sophisticated tools and equipment, and now we see images on screen in incredible lifelike “4K” precision. Professional brand MAKE UP FOR EVER constantly seeks to offer this industry’s professional solutions to meet their problems.